The personal wellbeing of ICAEW members and their families is at the heart of everything we do and we're always looking for new and innovative ways to help them live healthier lives. 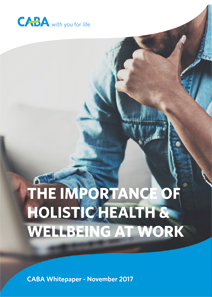 Therefore, we undertook a campaign to better understand the need for holistic employee wellbeing more fully, along with the best practice around it. Download your copy of our whitepaper to read the latest research. Do I need to fill out the information requested? No, other than the industry field the form is voluntary. Your privacy is important to us. We'll handle any personal data we collect in line with current data protection legislation. We ask for your volunteered information in exchange for a valuable resource in order to gather greater insight into who is downloading our research/whitepaper documents. If you would like to receive future research/whitepaper documents by email, please enter your email address on the form below and tick the box to provide your consent to receiving these materials. Yes, I would like to receive information about future research and whitepapers from CABA (email address required).